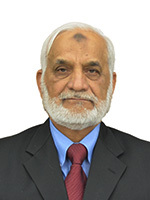 Col. (R) Azam Bhatti is a professional engineer and has 41 years of working experience at various positions both in Pakistan Army as well as in private sector. He is the executor of various mega projects i.e. Highways, Motorways, Airfields, Dams etc. and is also one of the founder members of Habib Construction Services (Pvt. ).Limited and working as a chairman of the board.